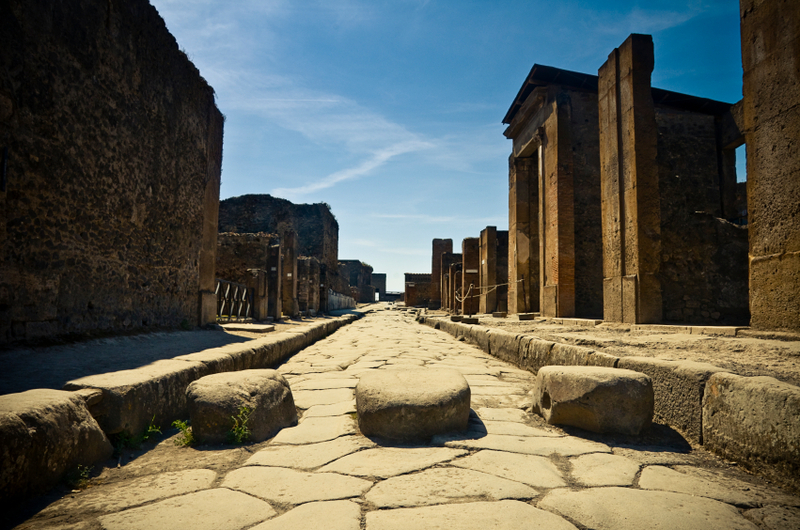 At the foot of Mountain Vesuvio there is Pompei, a cosmopolitan city, favorite destination of tourists from Italy and abroad, which was registered by UNESCO as World Heritage Site in the 1997. Its primary feature, which makes it a unique place in the world, is the enclosure of two cities under a single name . The ancient part, the pagan one, is buried under six meters of ashes and lapilli following the eruption of Mount Vesuvius in the 79 AD which caused many deaths. In the sixteenth century it was then almost accidentally discovered during the construction of an aqueduct. The new Pompeii, the Christian part, was born thanks to the work of Beato Bartolo Longo, who in 1872 had been commissioned it by the Countess Marianna De Fusco with the aim to administer her properties in the Valley of Pompeii. One of the main attractions of the city are the ruins, famous all over the world because, together with Ecolano, represent the only archaeological sites which givee visitors a true Roman experience. The city owes its exceptional state of preservation to the way it was originally buried. Tons of ash, pumice and lapilli buried it under a 6 meter layer thus preserving it from most of the ravages of time. The same pyroclastic materials, sticking to bodies, have retained their original imprint, allowing archaeologists to restore them as they were originally following their brief but excruciating agonies.